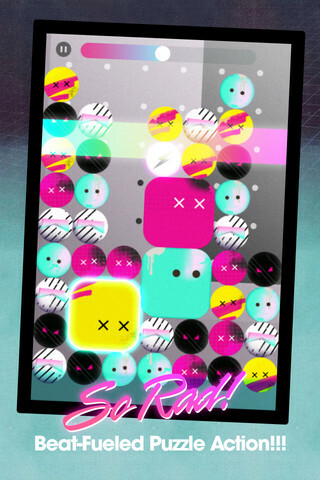 Radballs is an iPhone app from developer Glow Play that is also available on the iPod touch and the iPad. There are two types of gadget owners, those who are often caught staring at their gadgets and those who look for reasons to stare at their gadgets. Despite which category you find yourself in, Radballs will be sure to entertain. Radballs is a falling puzzle type of game in the vein of Nintendo’s “Puzzle League” series, with a modern twist. It features a rhythm aspect that is seamlessly implemented and urges you to crank the volume while you conquer 8 different scenarios. 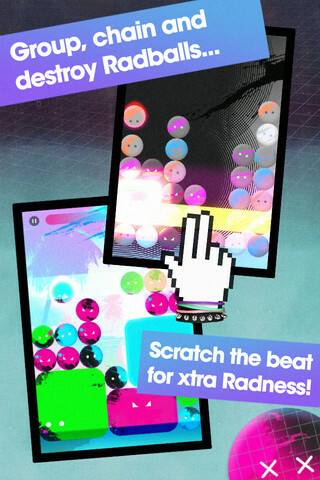 This game features “Radballs” of different colors falling to the beat of each campaigns electronic soundtrack. The objective is to swipe like-colored balls together, creating “MegaRadballs” that will be wiped off the screen by a constantly scrolling bar that is known as the “BeatWave.” By eliminating “MegaRadballs” from the screen, you add points to your “RadMeter,” which is constantly draining. If you fail to keep the “RadMeter” from emptying, you will have to restart the round. Likewise, if you manage to fill the “RadMeter,” you will complete the current round. The controls of this iPhone app are basic enough for anyone to catch on within a single round. A simple swipe of the finger slides “Radballs” around and a back-and-forth with the finger will “scratch” the “BeatWave” along with the soundtrack, while you eliminate blocks. The audio of this application is exceptional. The rhythm aspects are what separates Radballs from the average Tetris-esque puzzler. Radballs has it’s own upbeat-electronic soundtrack that you can take to the turntables with the use of the “BeatWave.” Glow Play even allows you to edit the soundtrack with your own collection of music. Radballs looks great. The loading screens are interactive and not too lengthy. Every scenario of Radballs features a different color scheme and background, and this is where my one gripe with these little balls makes it’s debut. I found myself second guessing the subtle difference in color of certain Radballs, on several occasions. Even so, the issue with colors is negligible and is easily solved with an increased brightness. Overall, Radballs is a great time-killer and that is what most of us are looking for in gaming on our iPod touch, iPad and iPhones. It is easy to pick up and play, but in 2 hours, I had nearly completed every level and even tried other modes of play. As with any successful application, new updates generally bring new content and even if that wasn’t the case, I probably will let Radballs accompany me in doctor’s offices and the occasional boring meeting for the foreseeable future. AppSafari review of Radballs was written by Darius Reimm on December 2nd, 2011 and categorized under Action, App Store, Fun, Games, Puzzler. Page viewed 5061 times, 1 so far today. Need help on using these apps? Please read the Help Page. Hey! Thank you for the great review 🙂 On the note of the difficulty – did you give it a stab on the Insane setting?